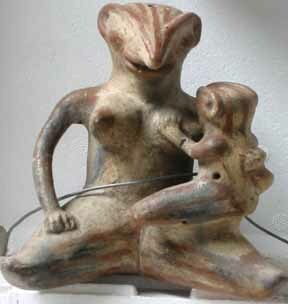 People may have lived at Sitio Barriles for thousands of years. At least one of the carved stones there (right) proves it. 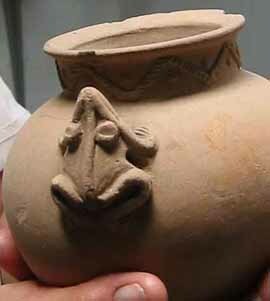 About 6 km from the community of Volcán in Panama's Chiriqui Province, there is evidence that the original inhabitants of what is now a private farm open to the public cremated their dead as recently as 2,600 years ago. Ashes found in burial urns have been carbon dated to 600BC. 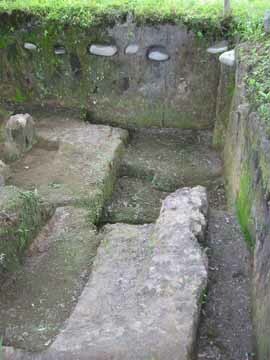 Handles of two urns can be seen at the bottom center and lower left of this picture, taken in part of an excavated area. 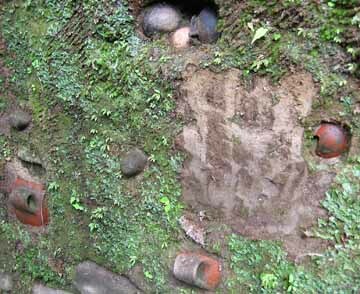 Cooking pots and tools were also buried with the dead, and can be seen higher up. 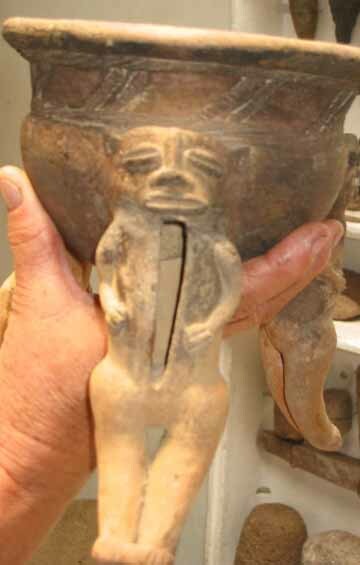 According to figures supporting a vessel found in Sitio Barriles, a vessel in which it is believed sweet grass was burned during funeral ceremonies, brains and all soft tissue from the body cavity were removed before cremation. Tools for food preparation, special stones for lighting fires, and vessels for containing liquid all show an accomplished civilization. 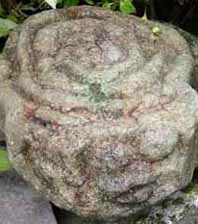 Some of the pottery suggests inhabitants must have used some form of pottery wheel, for instance. How else could the vessel to the left have been formed so perfectly? And the excavation by a German team of the foundation of a building six meters by 10 meters in size shows the inhabitants used a form of concrete made by mixing sand and clay for the foundation. They even had a form of invisible ink. One of the rocks at Sitio Barriles appears to have a blank surface, until water is sprayed on it. 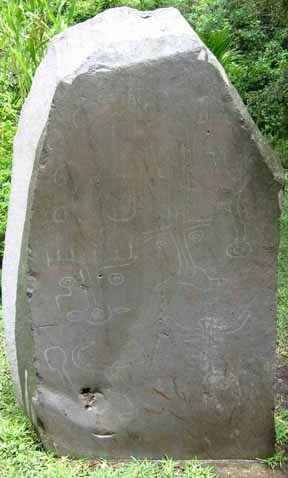 Then, hieroglyphic characters are plainly visible. Sitio Barriles is clearly marked on maps left by the early inhabitants as a place where special ceremonies were performed. Perhaps it was chosen because of an unexplained peculiarity. There is a two-feet wide split in solid rock on the property, left over from an ancient earthquake. 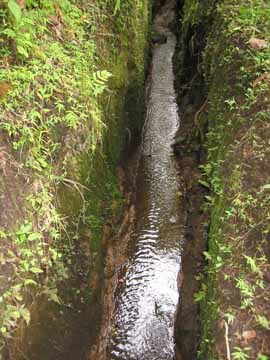 At the head of the rift is a pond formed by a sinkhole associated with a previous eruption of Volcán Barú. Fresh water flows from it in quantity. Edna Landau, the owner of Sitio Barilles, claims the stream flows uphill, gaining 10 meters in height over a distance of one kilometer. Maybe this is why what is now Sitio Barriles was chosen as a special ceremonial place. Or perhaps it was because of the mastery of artisans who shaped detailed figures such as this one, no bigger than a thumbnail, on the rim of a chalice with no more than sharpened stones. Or this one, perhaps depicting gods who were half man, half eagle. We may never know, but one thing is for sure: These people were organized, intelligent, and had structure to their lives in Sitio Barriles. To get there, go through the center of Volcán on the road to Rio Sereno. There's a blue sign on the left, just before the Ortega panaderia (bakery) that has a prominent Pepsi sign sticking out in front of it. Turn left and keep going through breathtaking countryside for about 6 km. The entrance to Sitio Barriles is on the right and easy to miss if you go too fast. Apart from the small sign, it looks like any other private driveway.